France's foreign ministry said on Thursday it had recalled its Italy ambassador for consultations after a series of "provocations" from Rome. "For several months France has been the subject of repeated accusations, unfounded attacks and outrageous declarations that everyone knows and can have in mind," the French ministry said in a statement. It added that the alleged attacks were "unprecedented since the end of the war". The move came a day after France denounced an "unacceptable" meeting between Italy's populist deputy prime minister, Luigi Di Maio, and France's anti-government "gilets jaunes" (yellow vest) protesters this week. President of the European Parliament, Antonio Tajani, weighed in on the row by calling compatriot Di Maio "an inexperienced minister". 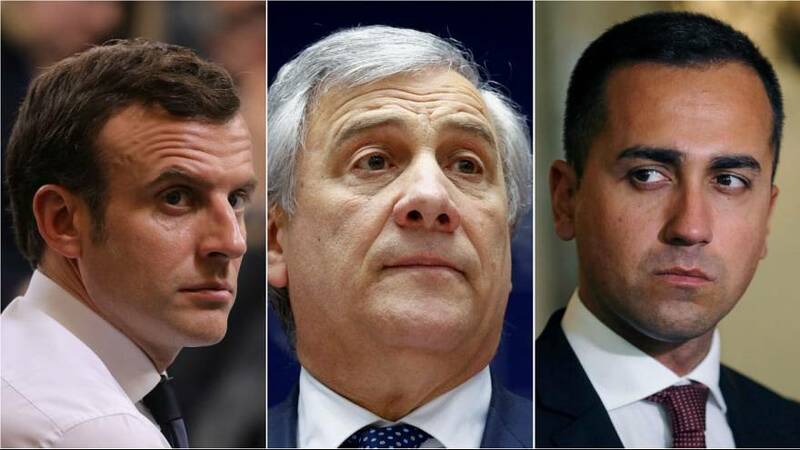 "The vice-premier Di Maio could very well have spared himself this mission in France to go and make deals with those who pull the Molotov against the police, who destroy the shops," said Tajani. "All this only to try to form a parliamentary group after the European elections. It is really sad, I would say squalid. And it is the Italians who pay the price, France has its responsibilities, but we risk moving from reason to wrong because of the whims of an inexperienced minister," he added. Di Maio, leader of the populist Five-Star Movement, met with Christophe Chalencon, a leftist "yellow vest" organiser from the south of France, near Paris ahead of the European elections. In a tweet, Di Maio wrote: "The winds of change have crossed the Alps" and on Thursday defended the meeting with some of the representatives of the "yellow vests" as "fully legitimate" in a Facebook post. "For me, that meeting is not a provocation against the current French government, but an important meeting with a political force with which we share so many demands starting from the need for direct democracy to give more power to citizens," Di Maio wrote. "This new provocation is unacceptable between neighbouring countries and partners at the heart of the EU," the French foreign ministry said about the meeting on Wednesday. Italy's Deputy Prime Minister Matteo Salvini of the right-wing League party said "we don't want to argue with anyone, we're not interested in controversy" and that the government was "very willing" to meet with Macron in response to the move. However, Salvini said France needed to address three "fundamental" demands: French police had to stop pushing migrants back into Italy and stop carrying out lengthy border checks that were blocking traffic at the frontier and that France must hand over around 15 Italian leftist militants who have taken refuge in France in recent decades. Tensions between Macron and Italy's two deputy prime ministers, Salvini and Di Maio, have flared since their election in June over issues about migration and Italy's budget. Di Maio accused France of impoverishing Africa and fuelling the migrant influx to Europe last week while Salvini has previously lambaster Macron in calling him a "terrible president". Speaking to French radio station Europe 1, former Italian Prime Minister Matteo Renzi said Italy's approach was "an incredible mistake" and deemed France's decision to summon its ambassador as "correct". Renzi added: "It is stupid to make war while we should be building Europe together."